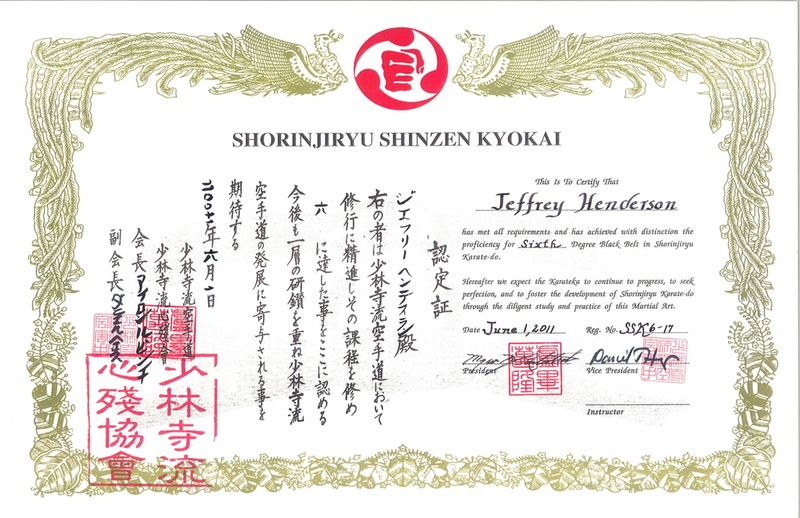 Dr. Jeffrey Henderson, holds a 7th Dan Black Belt in Bubishido and is the Chief Technical Director and Founder of The International Budo Institute. 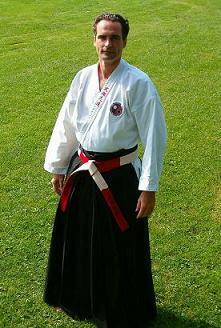 He has studied Karatedo, Aikido, Aiki-jujutsu, Kendo, Ken-jutsu, Bo-jutsu and Sai-jutsu. 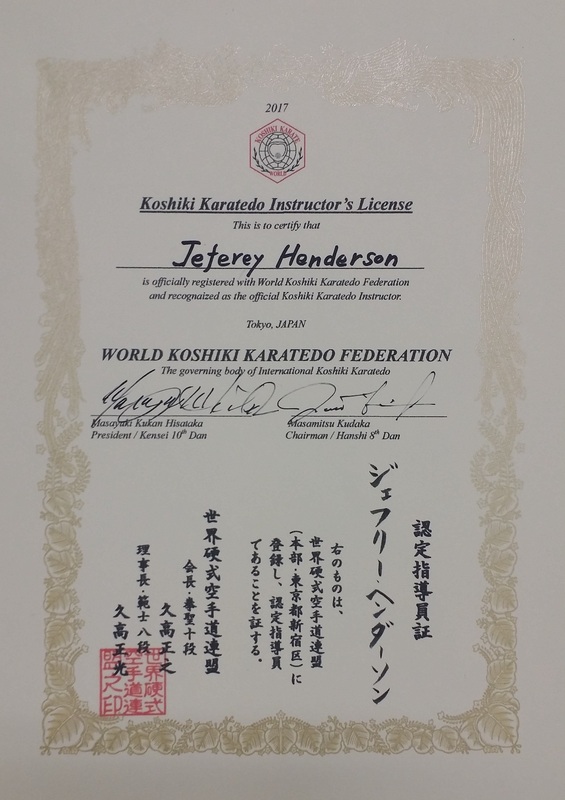 Dr. Henderson presently moves between Montreal, Canada; Malaga, Spain and Zurich, Switzerland. 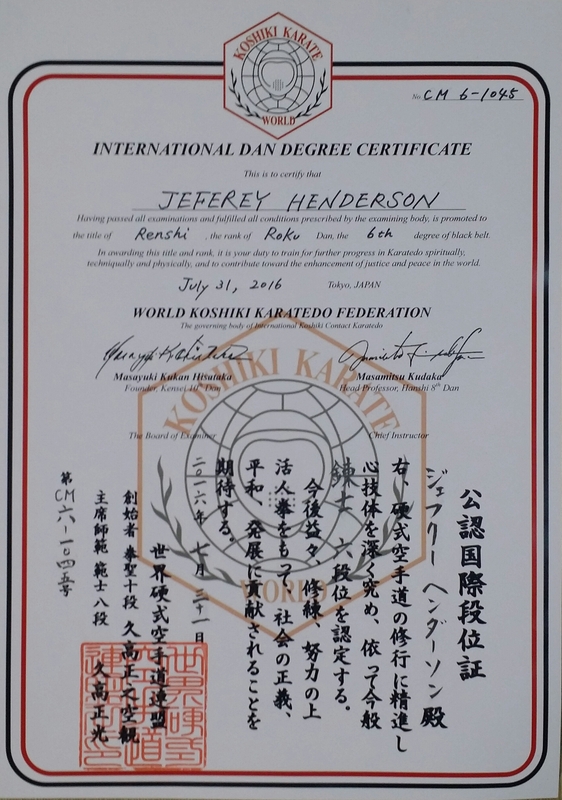 Dr. Henderson has taught hundreds of students since becoming a Sensei. 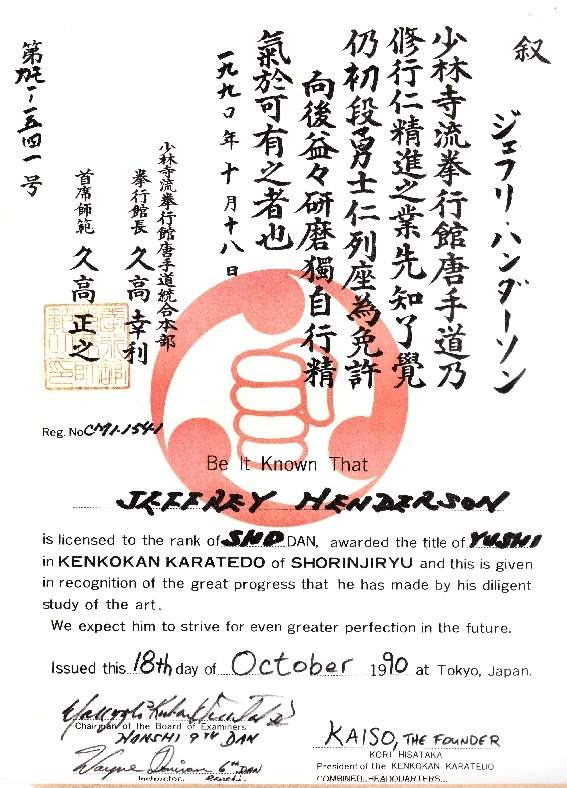 He began his martial arts career in 1982 and was awarded his Sho-Dan, 1st degree black belt from So Shihan Masayuki Hisataka, 9th Dan, of the world combined headquarters of Shorinjiryu in Tokyo, Japan. 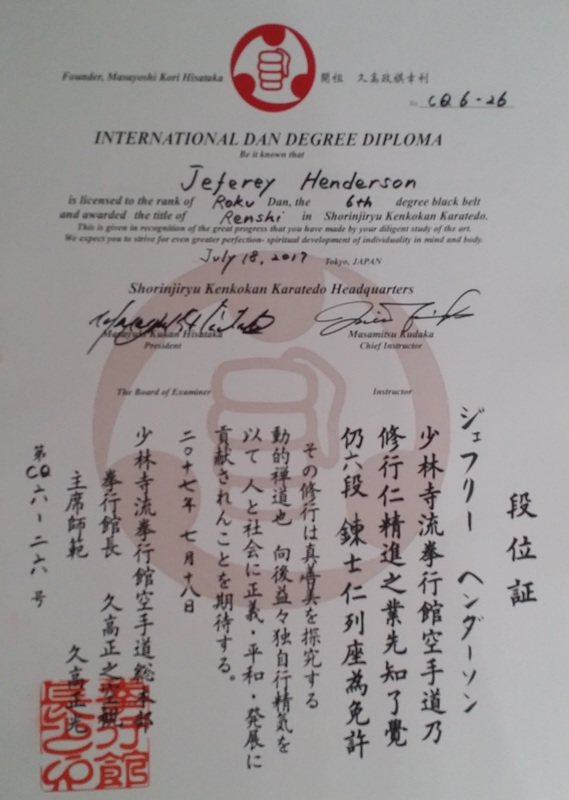 Dr. Henderson was recognized as 6th Dan, Renshi in Koshiki Karatedo in July 2016 and 6th Dan in Shorinjiryu Kenkokan Karatedo in July 2017 by Hanshi Masayuki Hisataka, 10th dan, at the Kenkokan Hombu dojo in Japan. 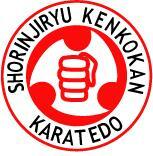 Dr. Henderson also holds the title of “Renshi” in both Shorinjiryu Kenkokan and Heiho Niten Ichi Ryu school of sword. 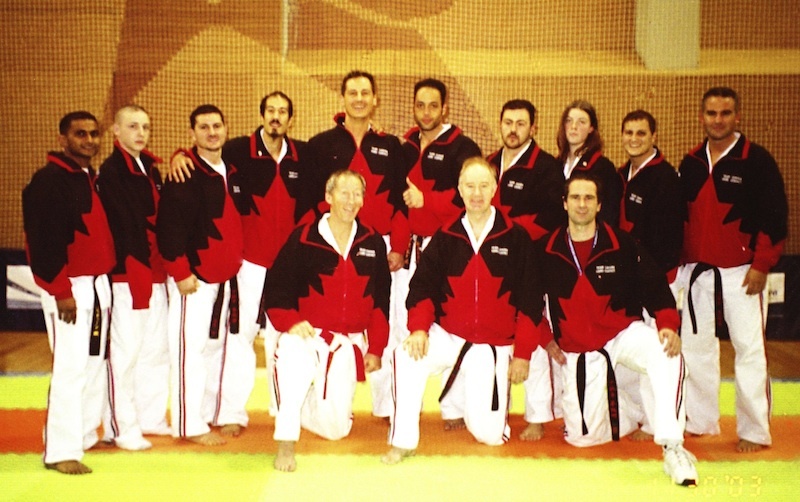 Dr. Henderson was also assistant coach to the Canadian Koshiki Karate Team for the World Koshiki Championships in Lisbon in 2003. 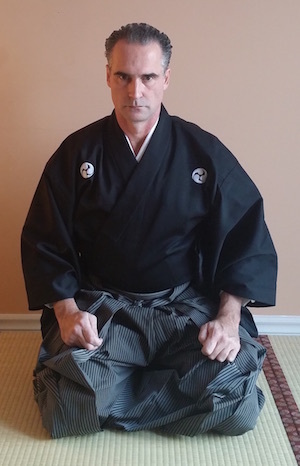 Dr. Henderson is also a member of the Shorinjiryu Shinzen Kyokai Organization and is also a member of the Kokusai Budoin in Tokyo, Japan. Academically, Dr. Henderson holds an undergraduate degree with distinction in Commerce (B.Comm.) from McGill University and also holds an International Master of Business Administration (M.B.A.) and Doctorandus Degree (Drs.) from Nyenrode Universiteit in The Netherlands. He also holds a Doctor of Philosophy in Business Research from Monarch Business School Switzerland. 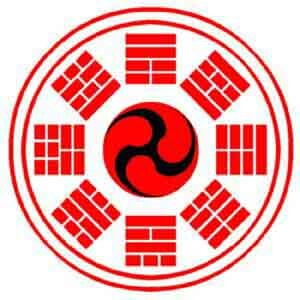 You may view his academic biography by clicking here. Dr. Henderson holds the position of President at Monarch Business School Switzerland. Before assuming the Presidency at Monarch, Dr. Henderson held the position of Dean of the Faculty and Dean of Studies. Earlier, he held the position of Adjunct Professor at the GGSB-Grenoble Graduate School of Business in France. Dr. Henderson is a chartered member of the Canadian Institute of Management where he holds the title of P.Mgr., professional manager, and he is also a chartered member of The Royal Institute of Chartered Surveyors in the United Kingdom. During his professional career, Dr. Henderson has held senior management and Vice President positions within the commercial real estate industry for such notable internationally operating companies as: Marathon Realty Co. Ltd., Reichmann International, Brookfield Properties Ltd., Kolter Properties and KPMG Canada LLP. His latest position held was that of Vice President of Portfolio Management at Bentall Capital, a commercial real estate asset management company with over $20 billion under management throughout North America and China.